The first National Thai Restaurant Week begins September 16 -22 in New York, Pennsyvania and New Jersey. Dinners will be discounted if a customer orders one of the three “must-try dishes” listed on the menu. Even though Thai food is one of the most popular cuisines in the world, Americans tend to only order Pad Thai, Satays, and my favorite Tom Kha Gai soup. The Thai Trade Center in Los Angeles and the Thai Government want Los Angelenos to be more adventurous when dining out at a Thai restaurant. 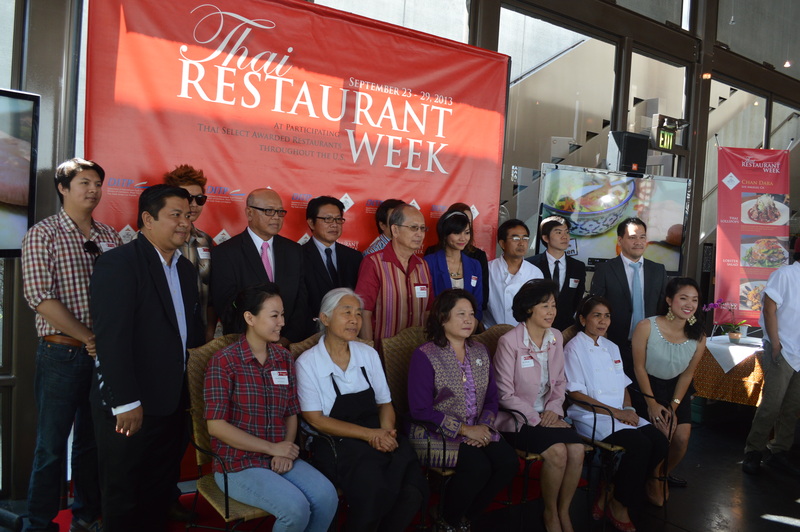 There are over 600 Thai restaurants participating in Thai Restaurant Week nationwide. On the West Coast there are over 300 restaurants participating during the West Coast Week from September 23 to September 29, 2013. Try one of the speciality dishes from Northern and the Northwestern regions, Central Thailand and the spicier and hotter Southern areas of the county. There are currently two restaurants participating in Arizona, almost 60 in California, two in Colorado, four in Hawaii, one in Idaho, one Montana, two in New Mexico, three in Nevada, six in Oregon, 11 in Texas, 24 in Washinton and one in Wyoming. 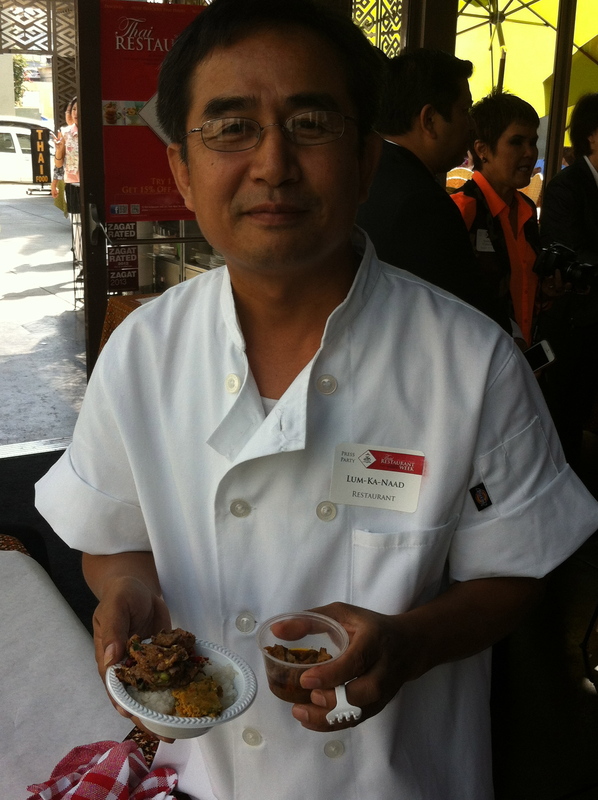 I was invited to a media tasting of six popular Thai restaurants in Southern California. The event was held at Saladang Song in Pasadena. Each restaurant presented three traditional dishes for guests to experience. Saladang Song starting with Yum eggplant with grilled shrimp and a delicious spicy lime dressing. It was fantastic. 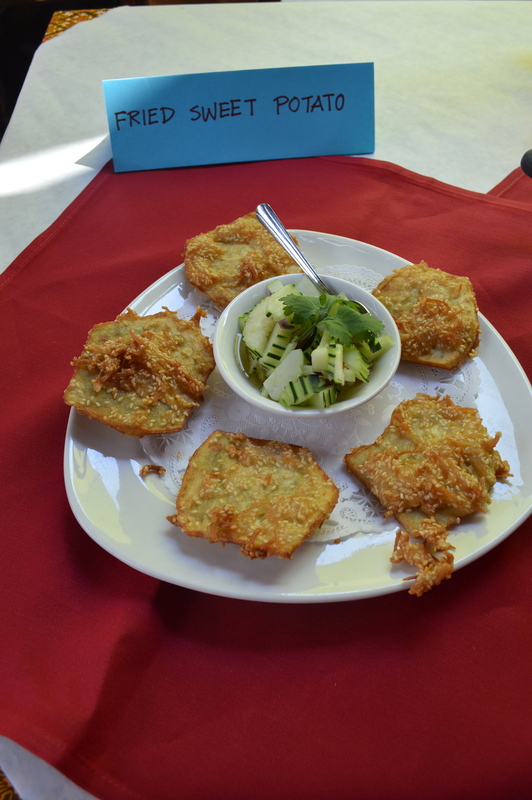 We all raved about the deep fried sweet potato with a slightly sweet cucumber salad. I adored the sweet grilled salmon served with steam broccoli. It was tender and flavorful. 383 S. Fair Oaks Ave. Pasadena (626)793-5200. For those living in the San Fernando Valley, the popular Lum-Ka-Naad in Northridge served a fantastic Aeb Pla – a traditional grilled turmeric curry fish cooked in a banana leaf. The Goi -Soi is usually a shrimp dish marinated in dry and fresh chilies, lime juice and shallots. The owner of the restaurant, Alex Amsombalee, told us, “We call it dancing shrimp, because when we put the freshwater shrimp into the marinade, they start dancing.” Today he prepared the dish with medium-rare thinly sliced beef. It’s a famous dish in the Northwestern part of Thailand. Last was the Kuagling Kradook Moo – bone in pork spare ribs cut into pieces and pan-fried with a slightly hot curry paste. This is a popular dish in the Southern province areas such as Krabi. (8910 Reseda Blvd. Northridge (818)882-3028. I’ve been eating at Chan Dara for over 20 years, so I was happy to see the staff at this Thai Restaurant Week event. 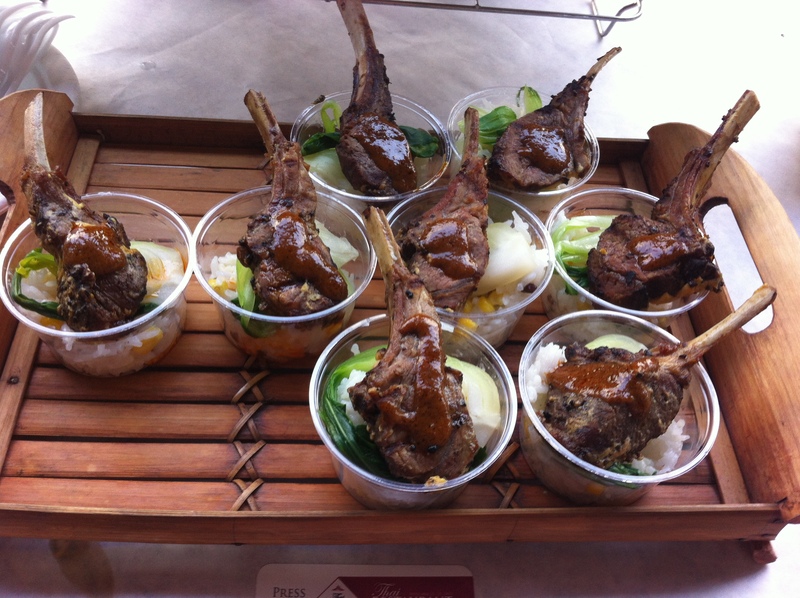 They prepared Thai Lollipops made with lamb chops in a Thai curry sauce and served with steamed bok-choy and luscious coconut rice. Everyone wanted seconds of the Maine lobster salad with avocado and tomato served over greens and dressed in a Thai chili-lime vinaigrette. They still have two locations – 310 N. Larchmont Blvd. Los Angeles – (323)467-1052 and 11940 W. Pico Blvd. West Los Angeles (310)479-4461. I really liked the staff at Lucky Elephant in San Dimas. They were very friendly in explaining the dishes they brought to the event. The Hormok Kanom Krok – salmon fish cooked in red curry and coconut milk was outstanding. 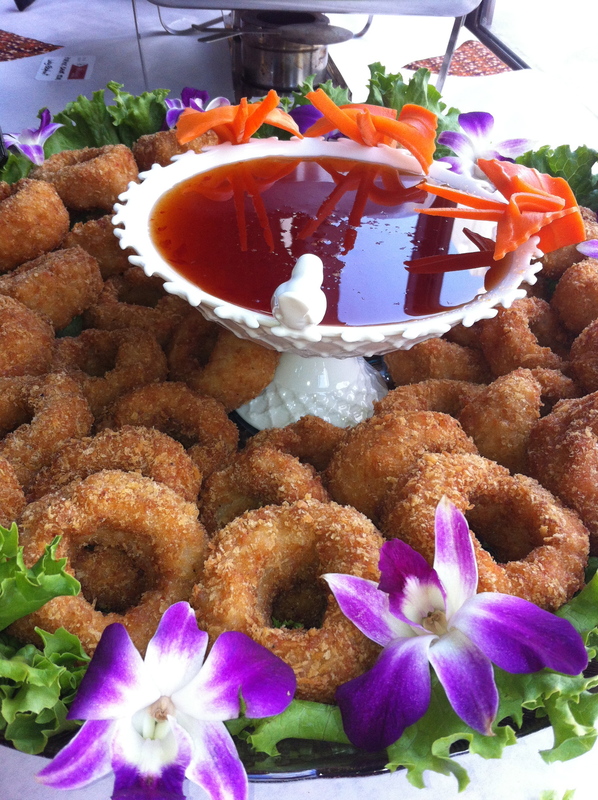 Everyone wanted to try a shrimp donut served with a sweet sauce. They also served a salad of deep fried enoki mushroom that was served in a Thai sour and spicy sauce. 531 W. Arrow Highway (909)592-4242. Isaan Station had a beautiful display of Som Dtum Goong Sod – a Thai shrimp dish. The Nham Dtok Mhu/Nue was made with spicy charcoal grilled pork or beef with red onion, mint leaves, lime juice, rice powder, cilantro and green onions. The dish Kohr Moo Yang is a charcoal grilled pork neck with a Thai spicy sauce. The restaurant is located at 125 N. Western Ave. Suite 111, Los Angeles (323)380-5126.